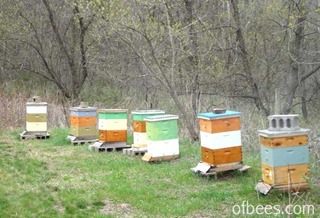 Here are the seven hives early in the summer when the weather was just starting to warm up. This year we tried out a new non-chemical form of pest management on one of the hives. This is a sticky board (exactly what it sounds like) which was in a drawer (under a screen so the bees wouldn’t get hurt by it). 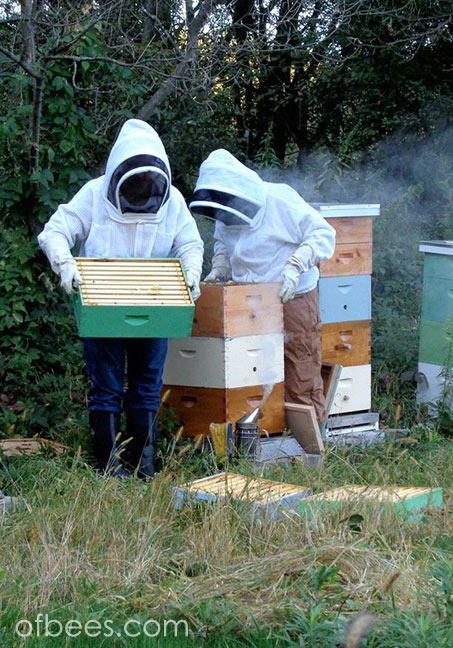 When the bees groom each other, mites get dislodged and fall to the bottom of the hive but just crawl back up and re-attach to bees. 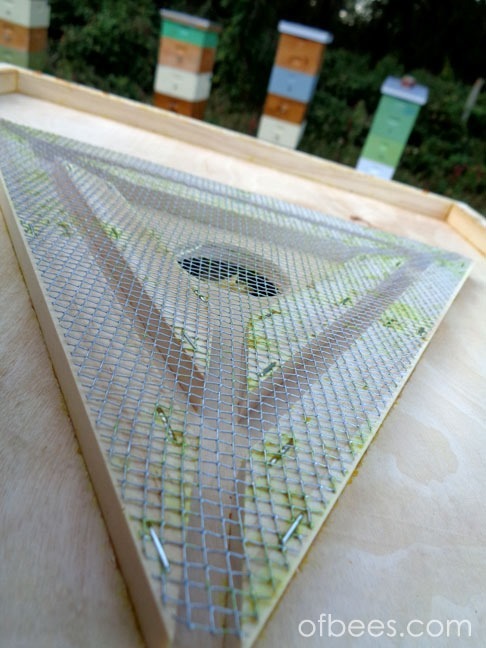 This board helps stop that cycle and gives the bees an advantage in their efforts to reduce parasitic mite infestations. We’ll see if it helps the girls survive the winter! 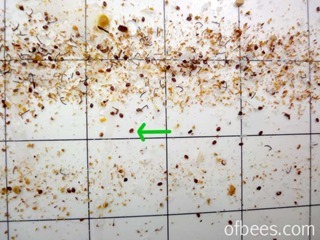 The green arrow here points at a mite - they look like little reddish brown ovals. 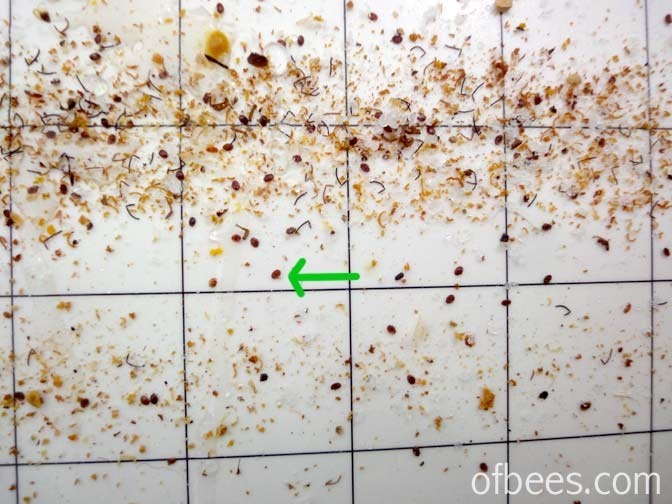 The other debris is bits of pollen, wax, bits of bees, and other debris. Healthy bees do not defecate in the hive. 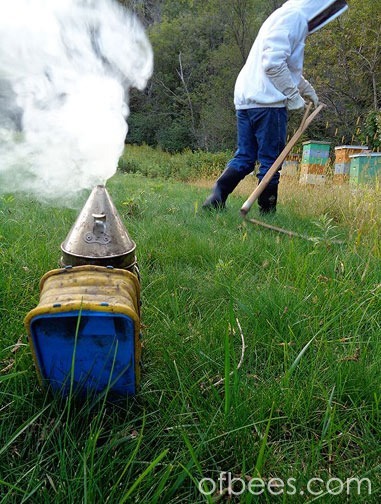 Roman mows the grass in front of the hives with a scythe. 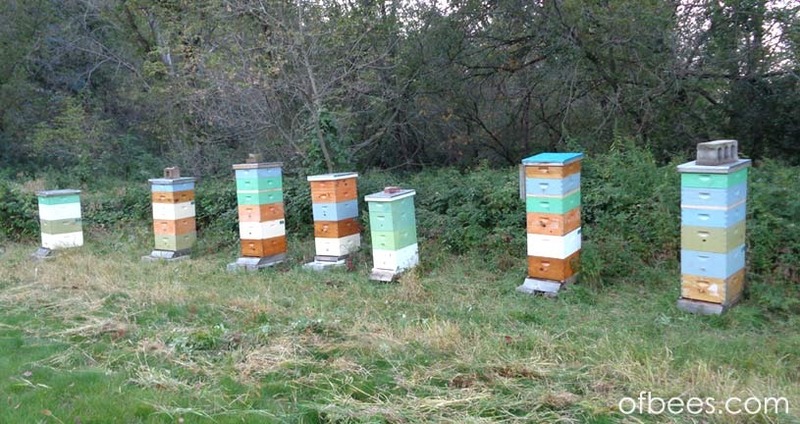 We keep the area clear so the bees have a clear ‘runway’ to come and go more easily. 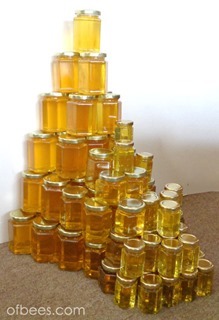 The apiary in late summer, stacked with honey supers (the smaller boxes on top), almost ready for the honey harvest! 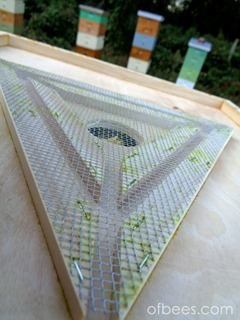 This is the underside of a ‘bee escape’ board – something we tried out new this year. 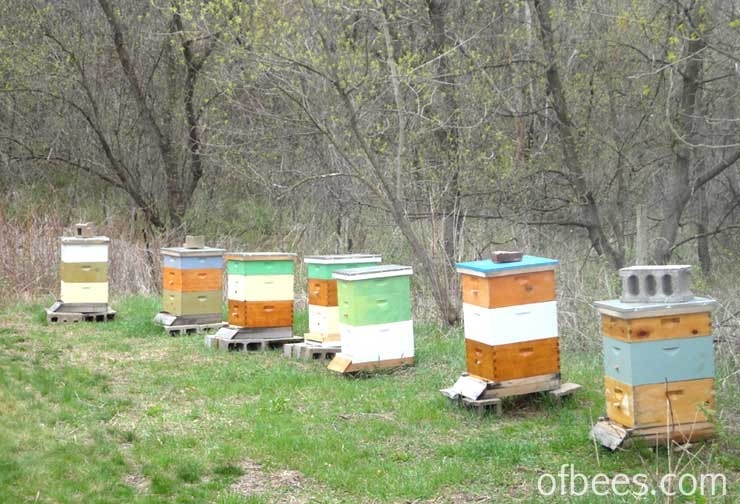 It works on an interesting principle of bee behavior that they will always turn when they encounter a certain angle – so they leave the honey boxes but can’t find their way back into them. This gets the bees out of the honey boxes so we can take them without using smoke (which affects the honey flavor) or chemicals (which are sometimes added to the honey boxes to cause the bees to flee). 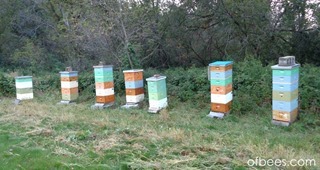 It takes a bit longer and multiple trips to the apiary to install/use but worked extremely well! 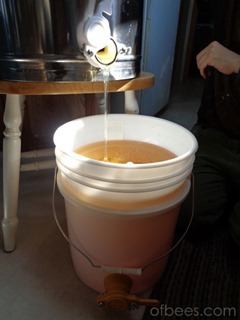 Checking and removing honey supers – you can see the bee escapes worked well and the honey boxes have almost no bees in them! Our photographer enjoying a piece of fresh comb during the honey removal process. 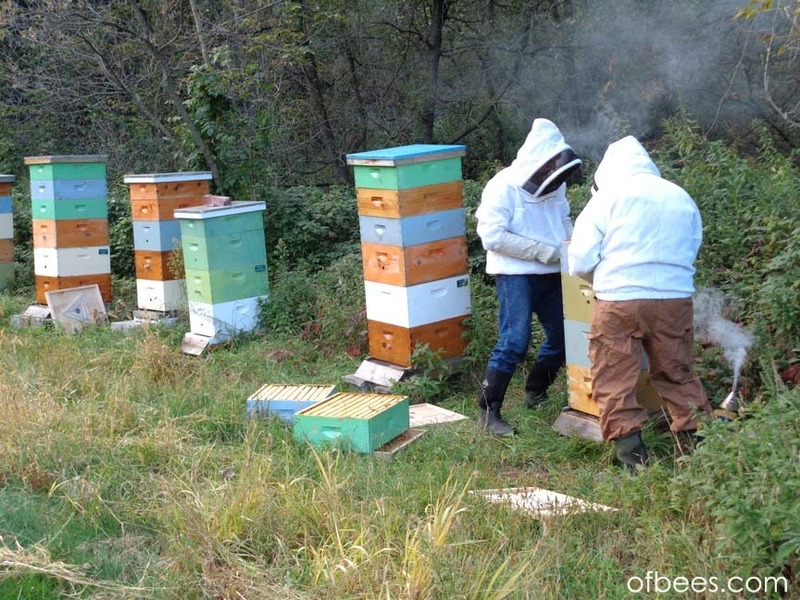 Working through the hives, getting them ready for winter and removing excess honey boxes. 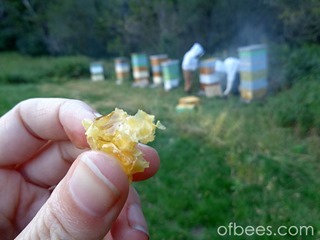 Uncapping a full frame of honey, preparing to extract it! 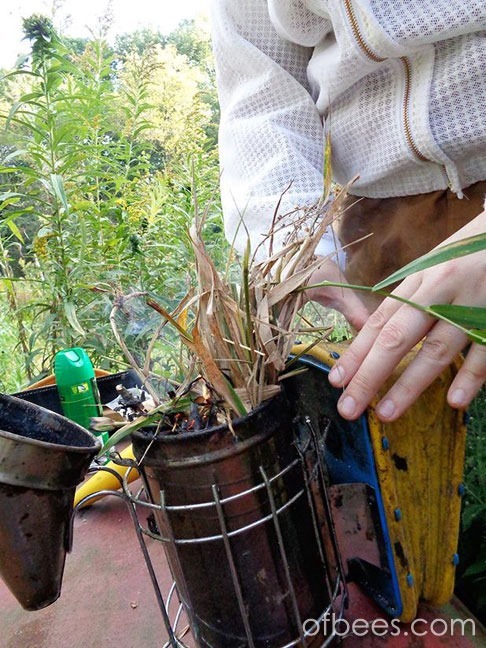 Once we have done this, the empty frames are given back to the bees to clean and re-use the next year. 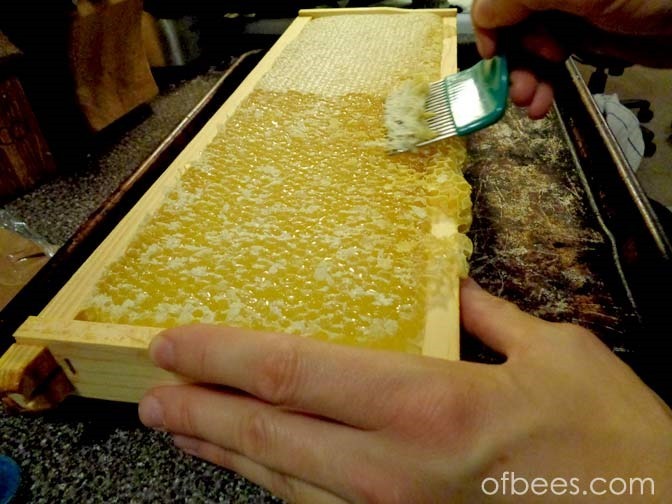 It takes bees eating seven pounds of honey to produce one pound of wax (which they secrete from special glands on the side of their bodies) so we want to take as little of it as possible to save them a whole lot of extra work. 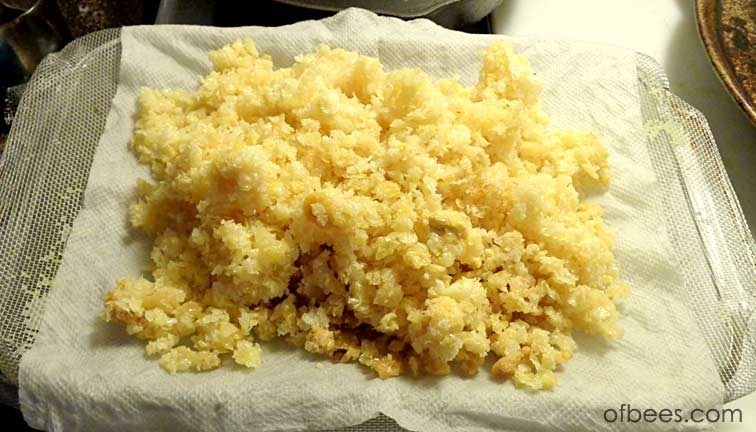 They won’t re-use the loose cappings, though, so there’s no point trying to give them back. Gorgeous, fresh, raw honey pouring from the hand-extractor into a holding bucket. I wish I could share how amazing the smell of this is! It makes the whole house smell like wildflowers. 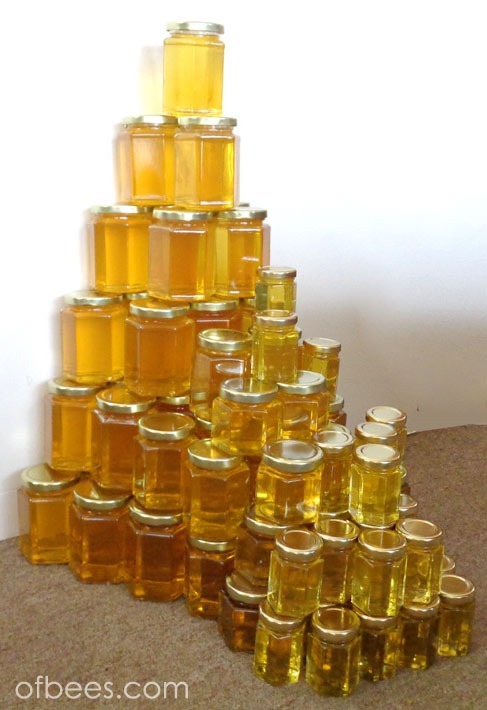 This is what fifty pounds of honey looks like, bottled and ready to get packed up for our hive sponsors. Those beeswax cappings we removed from the honey frames were saved, here is the start of the process to render them into useable beeswax. They are put on a paper towel on a metal screen over a glass container filled with water and heated slowly at very low heat. After an hour or so in the oven, the max has welted down into the water and this gooey sludge is leftover. 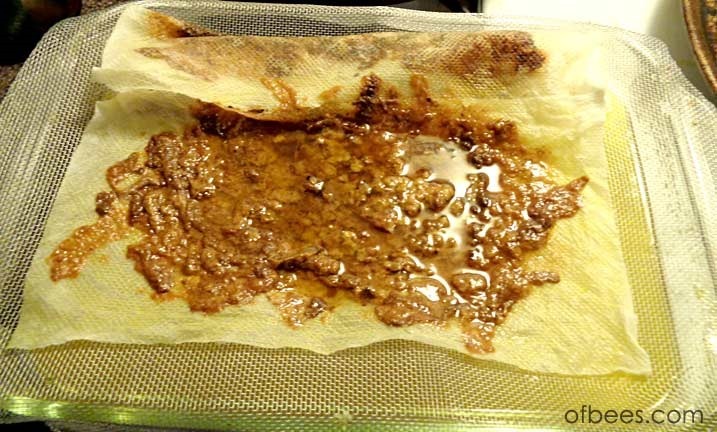 This stuff actually makes wonderful smoker fuel and smells much better than it looks. After the wax cools in the water, it floats to the top as a thin sheet, which we break into pieces. 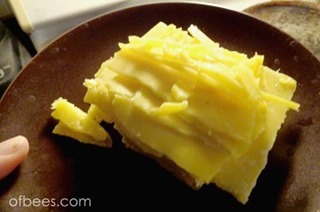 Tada, beautiful, natural, lemon-colored wax! 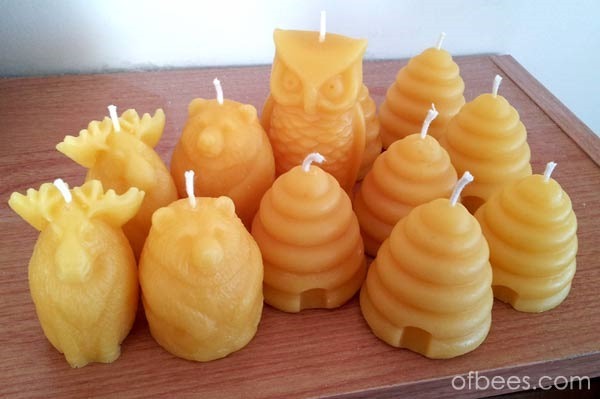 We re-heated the wax in a double-boiler and poured it into molds, making a variety of small candles. They smell so amazing, with a light scent of fresh honey to them. It was really time consuming, but fun. Our first ever candles from our own beeswax!